Update: Android Oreo has started rolling out to OnePlus 3 handsets. But if you want an even bigger upgrade you're in luck, because the OnePlus 5T has just launched. Third time's a charm, right? Well that's what OnePlus will be hoping with its third-generation flagship smartphone, the OnePlus 3. True to its 'Never Settle' mantra, OnePlus is pushing forward with its 'flagship specs for half the price' game plan, and with the new OnePlus 3 the signs are positive. 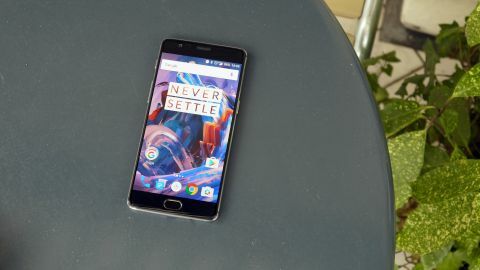 After the initial breakout success of the OnePlus One in 2014, the follow up from the Chinese outfit was a little lackluster, with the OnePlus 2 failing to reach the same heights as its predecessor. If anything, OnePlus was a victim of its own success, as expectations for its second installment went above and beyond what the still-small firm was capable of. OnePlus founder Carl Pei told me during a briefing for the OnePlus 3 that "people have very, very high expectations. We got very lucky with the first device, and people wanted more. We have to balance expectations with what we're capable of". As you may expect then, from a flagship handset costing just US$399 (£329, around AU$450), OnePlus has indeed had to balance features against expectation, but with the OnePlus 3 the compromises are more acceptable. There's no QHD resolution (you'll have to make do with full HD), nor is there a microSD slot, and users have just one internal storage option: 64GB. But if you can look past those minor shortcomings, and embrace the power, premium design and performance the OnePlus 3 is offering, this is the firm's best ever device. With a Snapdragon 820 processor, 6GB of RAM, 16MP rear camera, 8MP front snapper, fingerprint scanner and 3,000mAh fast-charging battery, the OnePlus 3 has the tools – on paper at least – to take on the big names. The OnePlus 2 claimed to be the 2016 Flagship Killer, and while it fell way short of living up to that boast, the OnePlus 3 may just be able to claim the title. The OnePlus 3 launched at $399 in the US and hasn't changed in price, but it's not the same for those in the UK. Since July 11 the OnePlus 3 has cost £329, instead of the £309 launch price, due to the Pound weakening after the Brexit campaign. However, just six months after its launch OnePlus ceased production of the 3 as it announced its beefed up brother - the OnePlus 3T. Since then the OnePlus 3T has also been discontinued and even the OnePlus 5 has been and gone, replaced by the $499/£449 OnePlus 5T. The single biggest advancement from the OnePlus 2 to the OnePlus 3 is the design. I forgave the original OnePlus One's polycarbonate looks because the phone offered such fantastic value for money, but when the OnePlus 2 came round many people, myself included, wanted more than what was on offer. Thankfully OnePlus has answered fan's calls for a more premium design, delivering its first metal uni-body smartphone in the OnePlus 3, cut from a single slab of aluminum. The result is pleasing. The metal chassis signals the evolution of OnePlus brand from a slightly shaky Chinese startup to a brand that knows what it's doing, and knows what people want. It doesn't break any new ground in terms of looks, with flashes of iPhone, HTC and Samsung, but it's great to eyeball and hold in the hand. You've got the choice of two colors. Graphite (basically Space Grey) was available at launch, but Soft Gold has only recently come into stock - and soft is certainly the right word. In some light the gold finish looks almost silver, but it's pleasing understated and is a lot more tasteful than the slightly garish Rose Gold attempts of late. Round the front you get a while panel instead of black on the graphite, giving the Soft Gold OnePlus 3 a brighter, lighter appearance. It's a shame that OnePlus hasn't taken smartphone design in a new direction, but a quick look at the top phones across all the major manufacturers shows that there's a fair amount of – how shall I put this – 'borrowing' when it comes to styling. Front-on the OnePlus 3 isn't anything special – it's a relatively standard black (or white, if you opt for soft gold) slab coated in Gorilla Glass 4, with the main feature being the indented fingerprint scanner-come-home-button oval below the display. The fingerprint scanner is much quicker at recognizing your digits and unlocking the OnePlus 3 than it was on the OnePlus 2, with a quoted time of just 0.3 seconds. While I can't vouch for the exact speed I can see that it's impressively quick, and I didn't have any issues when using it. OnePlus says it's faster than Apple's Touch ID, and I'm inclined to agree. Either side of the scanner you'll find touch-sensitive navigation keys which are only visible when tapped, with a single white LED illuminating for a couple of seconds before disappearing into the bezel. These are responsive and easy to hit, and you can program them in the settings menu, enabling you to perform extra functions with a hold action rather than a tap. You can also swap them round – so if you prefer your back key to be on the right rather than the left you can do just that. As well as the toughened Gorilla Glass on the front of the phone, OnePlus has also included a factory-fitted screen protector to prevent scratches, but it's a little annoying. It doesn't cover the whole screen, and at times I could see the edge of the protector running down each side of the display, which distracts from the on-screen action. Fortunately you can remove it pretty easily, and it doesn't leave any nasty residue on the glass – but you're unlikely to get the bubble-free finish if you try to re-apply it, so make sure you really want it gone before peeling it off. Along the left side of the 7.35mm-thick OnePlus 3 are the volume rocker and notification slider. The latter has three positions: all notifications, priority notifications and silent, enabling you to quickly adjust the setting without waking the screen. It's a hat-tip to Apple's mute switch on the iPhone, and it's something I found very useful during my time with the OnePlus 3 – especially when it came to quickly muting the phone during meetings and cinema trips. On the other side is the power/lock key, which sits below the dual-SIM tray. Yes that's right – the OnePlus 3 can handle two SIMs. On some other devices, such as the Huawei P9, the second SIM slot also doubles as a microSD slot, but that's not the case here – as mentioned, there's no expandable storage option. The explanation given to me by OnePlus's Pei for why the company continues to shun expandable storage comes down to user experience. "MicroSD is a big ask [from our fans]," Pei explained, "but it's not a good ask. It's not a good user experience". You may not agree, but that's the thinking over at OnePlus. The buttons are well positioned, and as long as your hands are big enough to grapple the OnePlus 3 you'll be able to hit them without issue when using the phone one-handed. There's nothing on the top edge, while the base is packed with a speaker grille, USB-C port and headphone jack – OnePlus certainly isn't ready to ditch the 3.5mm jack just yet, unlike Motorola with the Moto Z. Moving round the back, the gently curving rear and the antenna bands at the top and bottom of the handset are reminiscent of the HTC One M9, while the square camera bulge has something of the Samsung Galaxy S6 about it. It's a pleasing premium look, if a little understated, and its arched backed means the OnePlus 3 sits nicely in the palm, enabling you to get a decent grip around what is a large handset. The OnePlus 3 is a phone I really do enjoy holding, flipping it over repeatedly in my hand and gazing at it as it resides on my desk. There's nothing complex going on here, but it's that simplicity that I find alluring. In that sense it's similar to Apple's iPhone design, although the curved rear beats the flat backs of the Cupertino firm's handsets. Design-wise, OnePlus has done something special then. The OnePlus 3 doesn't look out of place alongside the iPhone 6S, Samsung Galaxy S7, HTC 10 and LG G5, yet it's almost half the price. For that, at least, it must be applauded.